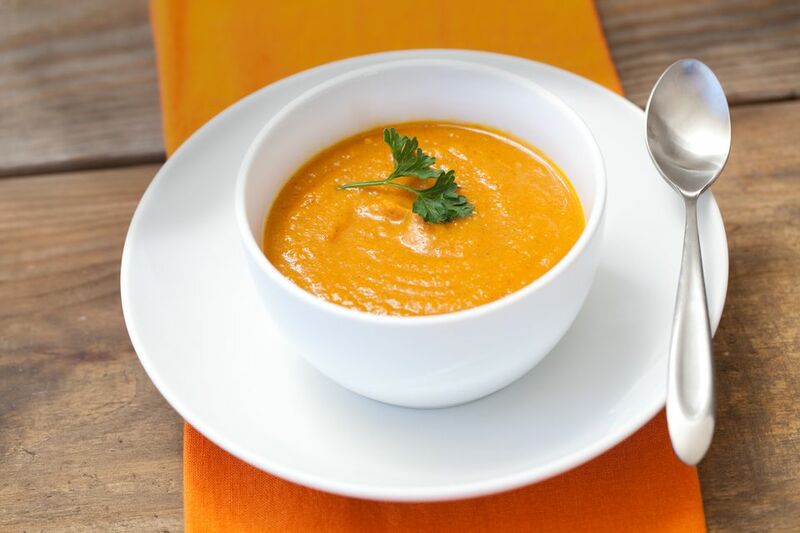 This is a quick and easy vegetarian and vegan pumpkin and coconut soup recipe that you can serve up in about 20 minutes. As it uses canned ingredients, it is also a great pumpkin soup recipe for when fresh pumpkin is out of season. We also like to add a bit of diced and sauteed tofu to pumpkin soup. Use a homemade vegetable broth and check your spices to make this pumpkin and coconut soup recipe gluten-free as well. In a large pot, sautee the onions in the margarine for 3 to 5 minutes, until onions turn soft. Allow simmering over low heat for at least 15 minutes, stirring occasionally. Now, wasn't that the easiest pumpkin soup recipe ever? Enjoy! Not only is pumpkin a delicious fall treat, but it has a bunch of health benefits, too. Pumpkin is rich in fiber, and research has found that eating a diet high in fiber may lower the risk of developing heart disease. It is also rich in beta-carotene and other antioxidants that have cancer preventive properties. In addition, pumpkin is rich in vitamin A, which promotes good vision. The fruit may also help you sleep better, due to its high levels of tryptophan, and is full of phytoestrogens that have been found to help lower blood pressure. This pumpkin coconut soup is made with coconut milk, which also has health benefits. Coconuts are high in fiber, vitamin C, vitamin E, B vitamins, iron, sodium, selenium, calcium magnesium, and phosphorus. And because coconut milk is lactose-free, it is a popular choice among vegans and those with lactose intolerance. Coconut milk isn't just great in soup. Try it as a base in your smoothies, too!